Let Garfield and Odie season to taste! 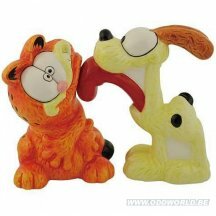 This fun Garfield and Odie Salt and Pepper Shaker Set features the lovable cat Garfield and his canine buddy Odie. Stands approximately 3 3/4-inches tall. Ages 13 and up. Order yours today!